As part of my daughter's cookie decorating birthday party, I obviously needed to make cookies. The sugar cookie recipe I have from my mother-in-law called for cream of tartar. I had no idea what cream of tartar was. At the grocery store, I set off to the dairy section and when I had no luck there I headed for the aisle that contained condensed milk. 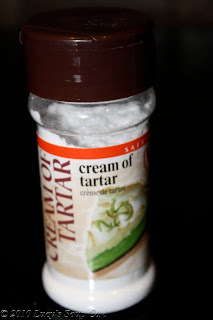 I mistakenly thought (as the name would imply), that cream of tartar was some sort of cream. I tracked down a store employee who looked like they might bake (i.e. a woman in the bakery section versus the 15 year old boy in the produce isle). She promptly took me to the spice aisle. It's a powder sold with the spices! After I got it home, I got curious about what exactly this stuff was. Here is what the jar says; "Cream of tartar is indispensable for a number of cooking and baking applications. Essential for use as a stabilizer for beaten egg whites, it is commonly required in angel food cakes and meringues. Cream of tartar helps prevent the crystallization of sugar in candy making and is often an ingredient in fondants and fudges". Ingredients: Potassium Bitartrate. Despite a number of university chemistry courses under my belt, I felt no closer to understanding what this ingredient was. So I dug a little deeper. Turns out is is an acid. Basically, it gives more volume to beaten egg whites and creates a creamier texture in candy and frosting by preventing the formation of sugar crystals . It is an essential ingredient in play doh and gingerbread house icing. If you are beating eggs, and don't have any cream of tartar, you can use white vinegar (~1.8 tsp per egg white), but your baking may turn out coarser. It can be used with white vinegar to make a pasty cleaning agent, which can be used to clean brass and copper cookware, and used as a stain remover for sinks and bathtubs. Cream of tartar and hydrogen peroxide can remove rust stains without scratching the surface (always test a small area first though). If mixed with sodium bicarbonate (baking soda), the two will neutralize each other, creating carbon dioxide and a sodium acetate solution, which mimics the action of baking powder. This is how most cooks made baking powder before it became commercially available (apparently, you need to be careful when doing this however). After all this, I have yet to understand where the "cream" part of it's name comes from, except to link it to the fact that it makes frosting and icing creamier (if any of you know, please do tell! ), but at least I learned something today. I had no idea what Cream of Tartar was either despite years of Chemistry classes. Now I totally have to go buy some and try it out. This is a great breakdown of cream of tartar, so thanks! I have only used it with egg whites, but always wondered what else it could be used for. Following from Social Parade!! Hope you have a great weekend and hope you come to our blog as well and follow us! We currently have a $25 Walmart Gift Card giveaway going on right now! :) Low entries! Wow I never knew that about it. Thanks so much for the information.